Halloween is one of my favourite times of year. Not really for its origins but because it’s a great excuse to throw a fancy-dress party where everyone is happy with the theme. And with themed parties comes themed cakes. And themed cakes are awesome. Around this time of year, you will see cakes depicting whole graveyard scenes, full skeletons, topped with a haunted house. If you are at this baking level of awesome, good for you! But this post is not for you. This post is a shout-out to all those whose cupcakes are never quite round and whose brownies are always a bit thin. I’ve been flitting around the realms of Pinterest (one of my favourite places on the internet) for easy Halloween ideas for those bakers with good intentions but not the means to follow through. Baking is accessible by anyone whose willing to give it a good go. 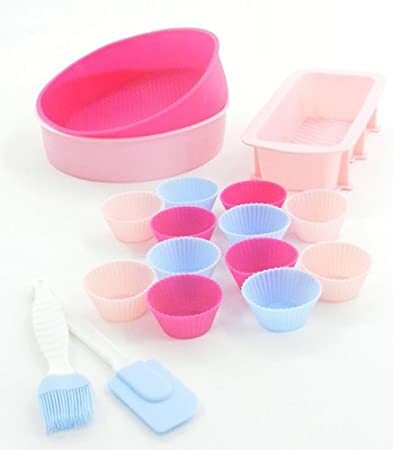 So, you can bake a cupcake, but not much else, this is the perfect post for you to expand your decorating skills. Or if you are like me and are really lazy, this list is perfect for you too! Here’s a twist to the simple cupcake- well more a 180 degree flip. 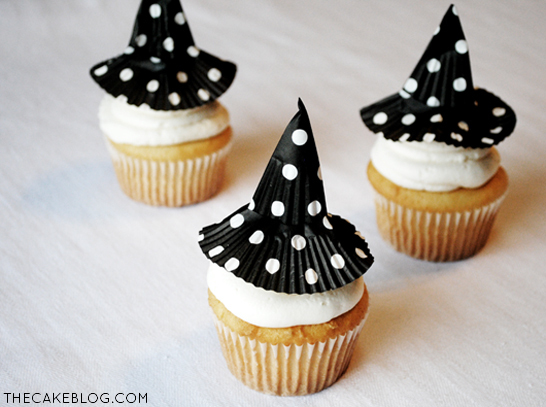 Serve your cupcakes upside down and add little candy legs, and you have got yourself one crushed Wicked Witch of the East! For more detail on how to construct the legs, do check out the original post. In fact check out the whole blog, Simple Sweet Stuff. You’ll find some really great ideas there. Strawberry jelly is homey, kiddie food- delightfully innocent, isn’t it? What about when you fill it with eyeballs and fingers. Yeah, didn’t think so. The eyeballs in this dessert are cleverly constructed by placing a jelly bean inside a grape, which is then placed inside a lychee. The fingers are marzipan with almonds for nails. The only down side is you have to be patient and let the jelly set a bit at a time so you get the body parts all the way through (instead they will all just float on the top) but I think it’s worth it. If you have the knack of pumpkin carving, these apple bites should present you with no problem. For those of you with less knife skills, the original post has a photo tutorial on how to cut the apples. 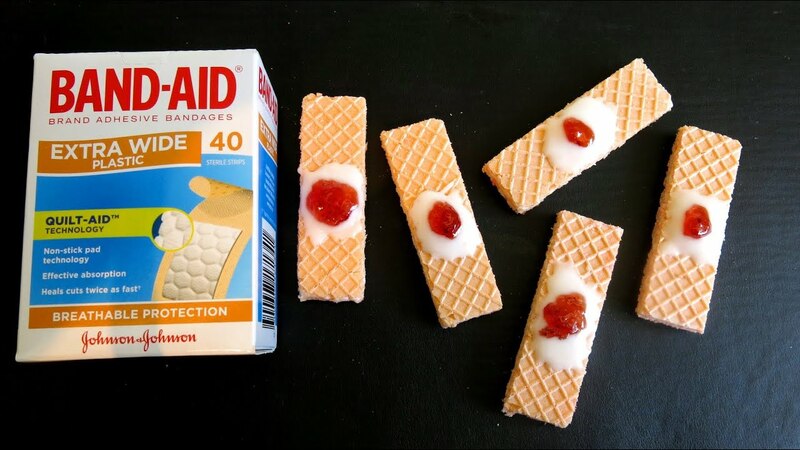 Once you have the shape of your ‘jaws’ add some jam or peanut butter and then almonds for the teeth. The result is surprisingly gory (yet delightfully vegan.) Oh She Glows is a fantastic source of vegan recipes with really detailed and insightful posts. I encourage anyone to have a look for yourselves. The original recipe for this is for a walnut cake but with some black writing icing and some liquorice, you can make any cake spooky. Simple yet effective. 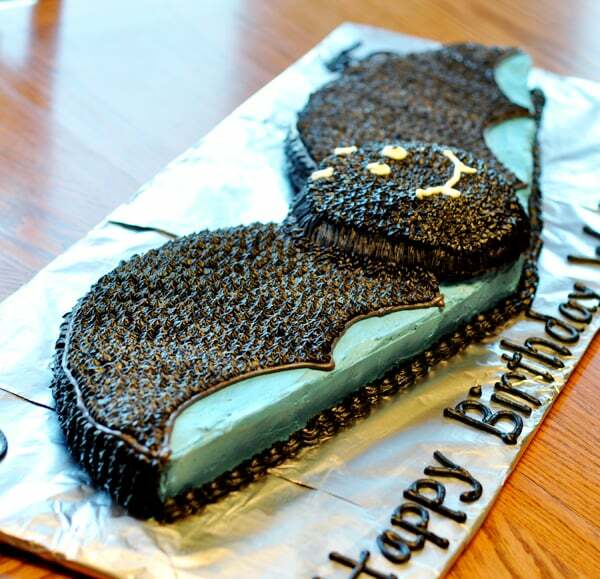 Also, you could try using white writing icing on black icing for an extra spooky look. While octopodes may not be one of the standard Halloween animal, cats, bats and spiders all tend to be quite dark. So add a bit of colour to your Halloween party and make these fabulously cute octopus cupcakes. All you need are lollipops, gummy worms and chocolate chips to create the sea creature. And to be honest, there is some a bit creepy about eating a cupcake with an octopus dumped unceremoniously on the top. Ah, we’re back on familar territory. You can’t argue bats aren’t Halloweeny. The ingenious thing about this cake is that it is made from one round cake- no need for fancy shaped cake tins. Just cut your standard round cake in half, position and frost accordingly. More clear instructions and photos are provided on the original post. 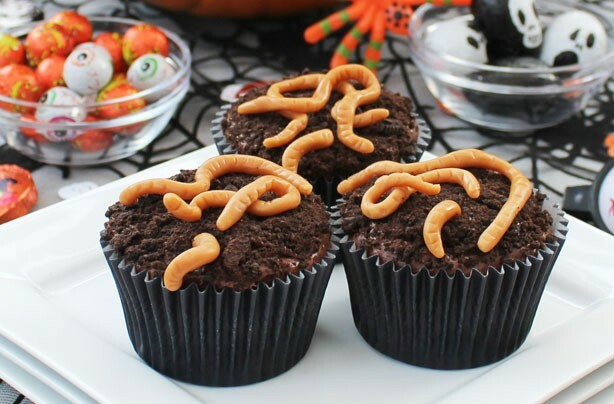 Top a chocolate cupcake with some crushed chocolate cookies for soil, then roll out pieces of fudge for worms to create this very satisfying look. If you make half worms and bury one end of them, it’ll give the impression the worm has burrowed into the cupcake! Not only do these look amazing, fudge and chocolate is always a brilliant combination so it’s guaranteed to taste great. Full photo instruction can be found on the original post. Let’s crank the disgust factor up a notch with some used plasters! Ew. These are made from wafer biscuits, topped with a bit of white glacé icing (icing sugar and water) and jam for blood. I’ve also seen this done with Graham crackers if you prefer that. These biscuits are probably best served next to a box of real plasters, otherwise I think they can be a bit ambiguous. By the way, this comes in the form of a video tutorial (how hi-tec!). That’s your lot folks. If you have your own easy Halloween bake ideas, leave a comment and a link below. I will most probably give it a pin and who know, maybe your bake will feature next year. All I have left to say really is Happy Halloween guys. Don’t scare yourself too much or eat too many sweets!